What Day Of The Week Was September 23, 1999? 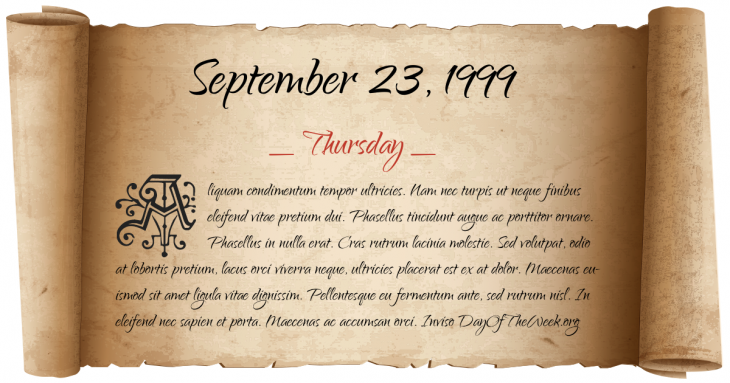 September 23, 1999 was the 266th day of the year 1999 in the Gregorian calendar. There were 99 days remaining until the end of the year. The day of the week was Thursday. A person born on this day will be 19 years old today. If that same person saved a Cent every day starting at age 4, then by now that person has accumulated $56.89 today. Here’s the September 1999 calendar. You can also browse the full year monthly 1999 calendar. Celebrate Bisexuality Day was first observed in the United States. NASA announces that it has lost contact with the Mars Climate Orbiter. Qantas Flight 1 overruns the runway in Bangkok during a storm. Although some passengers only receive minor injuries, it is still the worst crash in Qantas’s history since 1960.